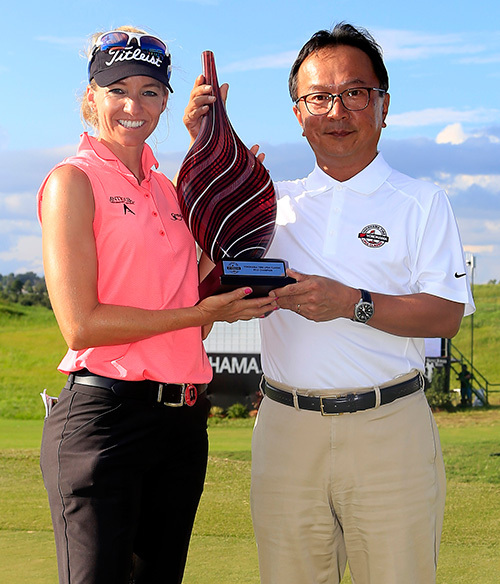 PRATTVILLE, AL – (Aug. 30, 2015) – Kris Tamulis shot a final round of 65 to win the second annual Yokohama Tire LPGA Classic in Prattville, Alabama at Capitol Hill along the RTJ Golf Trail. Tamulis won by one stroke over Yani Tseng and Austin Ernst. It was Tamulis’ first LPGA victory since joining the tour in 2005. Tamulis, of Naples, Florida, finished 17 under par for the tournament, good for a score of 271 and a first-place check for $195,000. The 11-year tour vet was seven under par on Sunday. After the tournament, Takaharu Fushimi, CEO of Yokohama Corporation of North America, congratulated Tamulis on the thrilling victory – which came down to the last hole – and presented her with the winner’s check and trophy. The four-day tournament also benefitted Yokohama’s cause marketing partner, KaBOOM!, a national nonprofit dedicated to ensuring that all children get the balanced and active play they need to thrive. All proceeds from the tournament will go toward building a new playground for a deserving community.